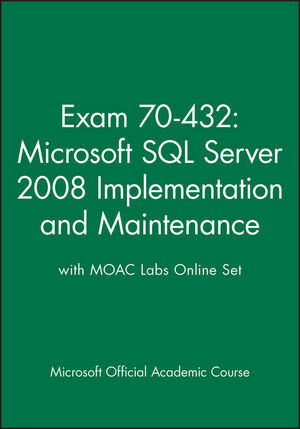 This book is for students preparing to become certified for the 70-432 Microsoft SQL Server 2008 Implementation and Maintenance exam. 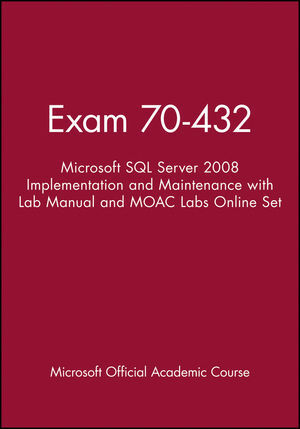 The Microsoft Official Academic Course (MOAC) lessons correlate and are mapped to the Microsoft Certified Information Technology Professional, (MCITP) 70-432 certification exam. This text covers installing and configuring Microsoft SQL Server and managing and maintaining databases and multidimensional databases, user accounts, database availability, recovery, and reporting. 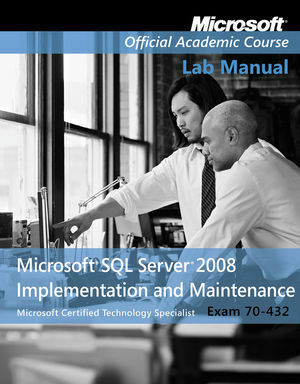 This text guides students through the design and implementation of security or server automation as well as monitoring and troubleshooting SQL Server activity. The MOAC IT Professional series is the Official from Microsoft, turn-key Workforce training program that leads to professional certification and was authored for college instructors and college students. MOAC gets instructors ready to teach and students ready for work by delivering essential resources in 5 key areas: Instructor readiness, student software, student assessment, instruction resources, and learning validation. With the Microsoft Official Academic course program, you are getting instructional support from Microsoft; materials that are accurate and make course delivery easy. Free MSDNAA license. Free 3 year MSDNAA subscription upon adoption of MOAC titles for new subscribers for the department available upon adoption.